Last week, everyone focused on the stock market sell-off. Reasonably enough, given the pace of the declines. But the analysts failed to pay enough attention to the very important shift. That change may be more important than Trump’s victory in the presidential election. Will the critical switch make gold shine – or dull? A crucial change is behind us. Powell is the new boss. Yellen is out. For better or worse, she doesn’t serve as the Fed Chair any longer. Although economists rated Yellen’s tenure very highly, President Trump didn’t renominate her for the position. Rightly or not? We don’t care. Let journalists debate endlessly – we will analyze the crucial Yellen’s imprints on the Fed, which could affect the gold market in the future. First, Yellen focused mostly on the labor market, not without some successes. We don’t attribute it solely to her, but the unemployment rate fell from 6.7 to 4.1 percent under her tenure. As a reminder, the Fed has a dual mandate: maximum employment and stable prices. Although many Fed officials used to worry about high inflation, she was different. Yellen didn’t fear the uptick in inflation as long as there was a slack in the labor market. She, thus, believed that ultra low interest rates could and should stay near zero for far longer than previously thought to combat unemployment. Yellen hiked them not earlier than in December 2015. Since then, she gradually raised them to the range of 1.25 percent to 1.5 percent, which is still very low. The gradual tightening was positive for gold, which would have likely struggled more, had monetary policy been more aggressive. If Jerome Powell continues this cautious policy, gold may shine, despite rising interest rates. Second, Yellen managed to start the unwinding of the Fed’s massive balance sheet, without triggering stock market turmoil. After unconventional actions of Bernanke, she had to get back to normal monetary policy, but not too fast. She definitely succeeded. If anything, the Fed is behind the curve. This is why gold wasn’t strongly hit by the Fed’s tightening. The U.S. central bank raised interest rates a few times, but the financial conditions remained easy. Third, Yellen mastered communication with the public. She held quarterly news conferences and smoothly telegraphed the Fed’s moves well in advance. Thanks to well-planned expectations guidance, Yellen – contrary to Bernanke who triggered a taper tantrum by his unexpected remarks in 2013 – avoided any major stumbles. The clear communication transformed gold’s reaction function. 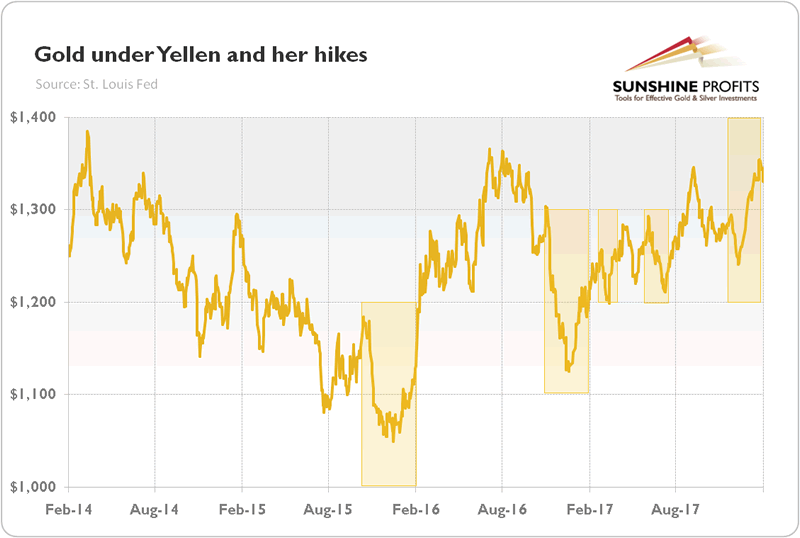 The yellow metal now reacts more to the changes in the rate hike expectations than to real monetary policy decisions. Sell the rumor, buy the fact – as one can see in the chart below. Jerome Powell – Great Continuator or Game Changer? Jerome Powell is now the new Fed Chair. Analysts expect that he will continue Yellen’s stance. But will he? How you play depends on your opponent. Yellen faced a sluggish recovery. But Powell sees tax cuts, higher economic growth, very low unemployment and perhaps finally rising wages. He will have to deal with the accelerating inflation, so Powell could move faster on normalization. Actually, such a scenario scared some investors last week into deciding to sell their equities. As people weren’t sure what to expect of Powell, good economic data turned out once again to be bad news for the financial markets. Surprisingly strong payrolls make traders to worry that the Fed will tighten its stance more. Hence, unless Powell convinces the markets that he will continue Yellen’s gradual approach, gold may react paradoxically for a safe-haven: decline on bad news and rise on good news. But will he intervene to calm the financial markets? We don’t bet on that. Greenspan cut interest rates after the stock market declined 35 percent in the three months after he became the Fed Chair, but the current downturn is much smaller. Actually, we have seen some rebound since Friday. Another paradox: the correction in stock prices may help Powell in doing his job, because lower equity prices could relieve concerns about the formation of dangerous asset bubbles. The conclusion is clear: although the latest declines were a tough welcome for Powell, they may actually be helpful for him. He is expected to continue Yellen’s policy. It is generally true, but economic conditions changed as well as the composition of the FOMC in 2018. It is now more hawkish than last year. Given these developments, the shift from Yellen to Powell may importantly strengthen the hawks among the Fed. Hence, unless the correction evolves into turmoil, we still expect three (or even four) hikes this year. Indeed, according to CME data, the Fed remains on track to lift the federal funds rate in March. The market odds of a hike are above 75 percent. Higher interest rates should theoretically be negative for gold. But the usual link seems to be broken now. The part of the answer is the U.S. dollar. Another issue is that we are in the late stages of the economic cycle – as the cycle matures, volatility increases and investors start to buy more gold as a hedge. Tomorrow, we will see the newest CPI report, which may affect the markets, given that inflation worries were one of the key reasons behind the recent stock market volatility. Stay tuned!